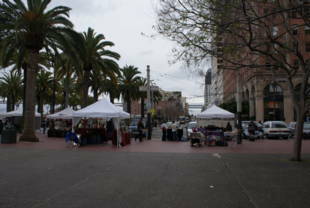 Justin Herman Plaza is a very popular place for working people to eat their lunch. A well groomed grassy area off Steuart St is perfect for a picnic in the park with your loved ones or take your dog for a walk. The palm trees surrounding the space and the fact that it's right on the waterfront makes this place very special. 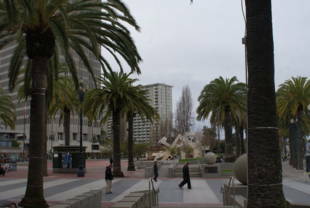 It is close to everything: the Ferry Building, The Embarcadero Center, and anything on Market St.
What's iconic about this spot is the Vaillancourt Fountain and its abstract design. 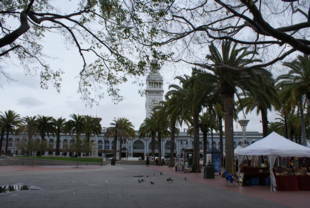 Justin Herman Plaza is owned by the San Francisco Recreation and Park Department. 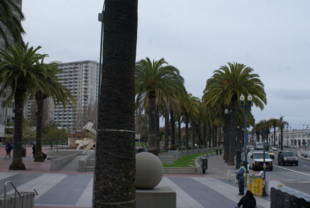 You can take BART or Muni to the Embarcadero Station. 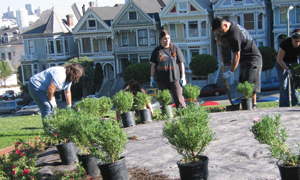 Parking is a particular problem downtown and it is recommended that you take public transit. Besides, BART is very fast! This spot has been particular popular with skateboarders. If you want to enjoy skill on a skateboard, come here on an afternoon and watch the boarders. Every year on Valentine's Day is the world famous San Francisco Pillow Fight where thousands of people gather to have one large pillow fight at Justin Herman Plaza!